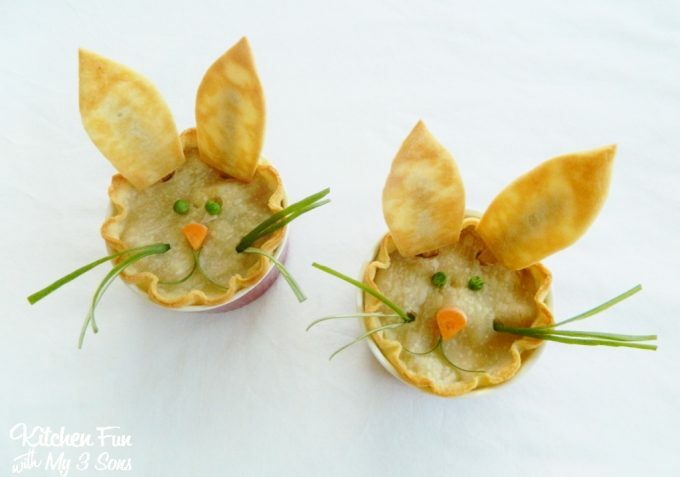 We came up with these cute Easter Bunny Chicken Pot Pies last night for dinner and thought we would go ahead and share today since it’s Pi Day (3-14)! My 6 year old is the only one out of my 3 boys that loves pot pie. My other 2 are not fans of pot pie so we love to make them into something fun! Decorate with green onion, carrots, & peas! Chop up your celery and carrots. Put your chopped veggies, peas, and diced chicken in a large pot and cover with water. Bring to a boil for 15 minutes. Remove from heat and set aside. Save about 8 carrot slices and 8 peas for the bunny face. The ears will take about 10 minutes to bake. In the saucepan over medium heat, cook onions in butter until soft. Stir in flour, salt, pepper, and celery seed. Slowly stir in chicken broth and milk. Simmer over medium-low heat until thick. Remove from heat. Place the chicken mixture in bottom pie crusts and pour the flour/milk mixture over the top. We had so much fun making this and we hope that you will too! If you have a picky eater, have them help make this. 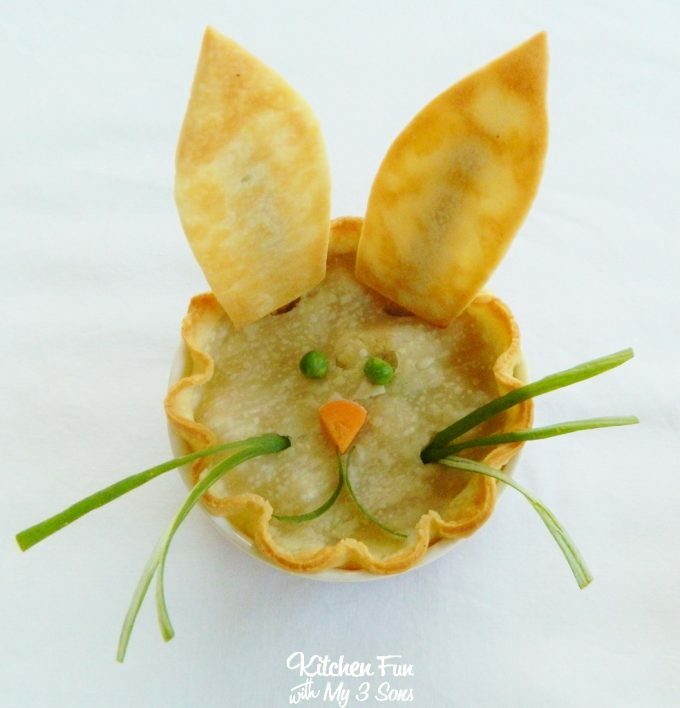 They will be so excited about their cute Bunny Pot Pie creation and definitely give it a try! You can check out all of our other fun Pot Pie creations HERE! You can check out all of our other fun Easter creations HERE! « Previous PostSt. Patrick’s Day Shamrock Lime Yogurt Pops! Next Post » Our 2 Year Blog Anniversary with 30 of our Best Fun Food Creations! 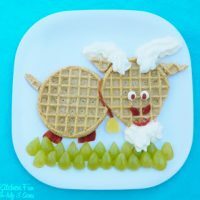 Leggo my Eggoat Breakfast & Eggo Giveaway!!! OH NO! 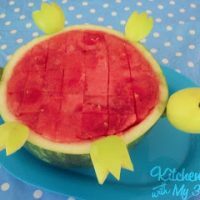 The Turtle Turned Over Watermelon! So cute! My grandkids would love these! Found you from Creative Timeout Party. These are so adorable! I am featuring them on my home page slider! If you would like you can submit additional crafts and food ideas yourself…I pinned it too! Very cute! Thanks for sharing at Bacon Time! This is a great way to get kids to eat their food. When they help make it, they usually, want to eat it. They are so adorable. Thank you for sharing. These are so stinkin' cute! You are so smart!! Thanks for sharing at the Monday Funday link party this week! Oh – definite Pin! Way cute. I would love to make this for the grandbaby someday 🙂 Very creative! Adorable! My little man would love these! Thanks for sharing at Monday Funday! These are so cute! Great idea. Would you consider linking this up at my Pinworthy Projects Party? I hope to see you there! I love chicken pot pie! However, my hubby and kids don't share the same love for it so I don't make it often. Making them into bunnies may persuade the kids to like them though! 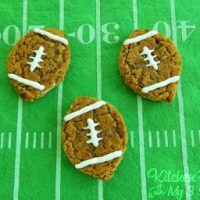 These look so adorable and delicious! How could a kiddo refuse such an adorable little pie?? I think my 3 year old (and my 1 year old, for that matter), would love this. I'd be thrilled if you'd link up at this week's Off the Hook! Just txt my sister we both lllooovvveee how imaginative & creative your genuis … would love to know where to buy your book, just email me the address is above …. have a great fab day wknd cheers! Trying to Pinit, but it isn't working for me. help?! Featuring soon at Bacon Time! Oh my gosh! Now that is seriously the cutest chicken pot pie I have ever seen!!! You are so creative and I love it!!! Getting the filling hot before you top the pot pie will help to cook the pie crust from the inside out. 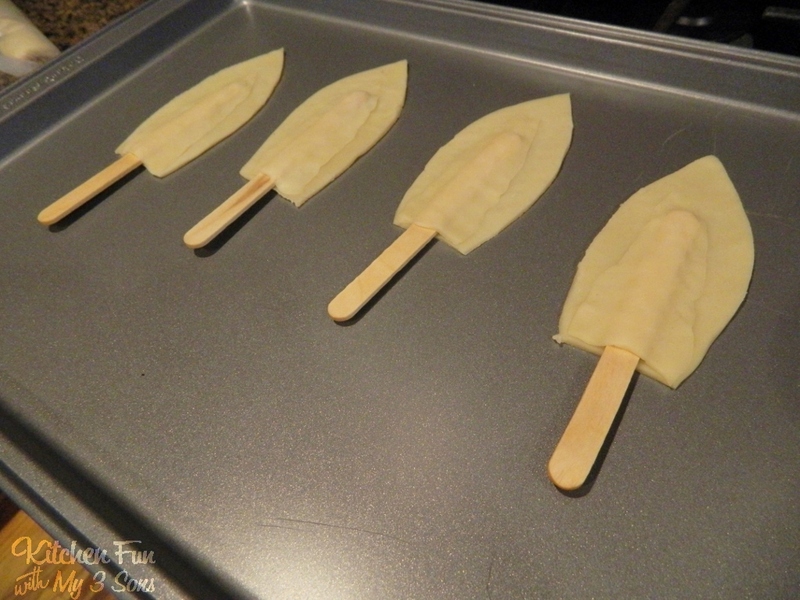 It will cook more evenly, preventing a soggy pie crust or biscuit bottom. Your crust will have a perfectly golden top with a deliciously flaky texture. Getting your filling nice and piping hot also helps reduce the bake time.